This morning my husband decided to make oatmeal. He likes brown sugar and cinnamon in his oatmeal but I realized that I had used the last of the brown sugar making peanut butter cookies on Saturday. 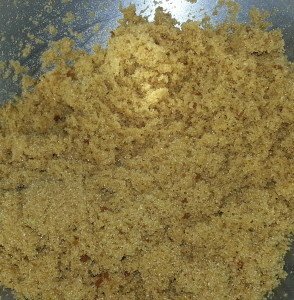 Then I remembered how easy it is to make brown sugar. I mixed up a batch and now my husband is happily eating his oatmeal. If you don’t use a lot of brown sugar or just recoil at the price of it, this recipe is for you. It smells amazing and tastes so much better than the stuff you buy in the store. Your brown sugar will be light and fluffy. This recipe makes light brown sugar. If you need dark brown sugar, add up to one additional tablespoon of molasses and mix well. Add ingredients to your mixer bowl. Using your beater attachment, beat on high speed for 1 to 2 minutes. Scrape down the bowl and beat an additional 1 to 2 minutes until everything is incorporated and your sugar is light and fluffy. Store any leftover brown sugar in an airtight container. Makes 1 cup of brown sugar.